Did you go through orthodontics? Have you ever had a tooth filled? Few of us could answer “no” to either of these questions. Back in the 1930s, a brilliant Cleveland dentist by the name of Weston A. Price became disturbed that he saw more and more patients who suffered from dental cavities, crooked teeth, and what he called “facial deformities” – overbites, narrow faces, pinched nostrils, and underdevelopment of the nose. Often, the same people who came to him with dental complaints had other serious medical problems too, such as arthritis, osteoporosis, and chronic fatigue. What bothered him most, though, was the increasing number of children who experienced frequent colds, asthma, allergies, anemia, lower-than-normal I.Q.’s, and behavioral problems. Is God’s Design To Blame? Was God to blame for the physical degeneration Dr. Price saw in his fellow Americans? He was inclined to believe that the creator designed us to live full and meaningful lives in healthy bodies. But that wasn’t what he saw. In an earnest desire to find the answers, and because he couldn’t find a group of people anywhere in the United States who were truly healthy, he set out on a 10 year journey to study primitive people groups all around the world that were still eating traditional, primitive foods as the mainstay of their diets. What he discovered was amazing and thoroughly confirmed what he suspected. 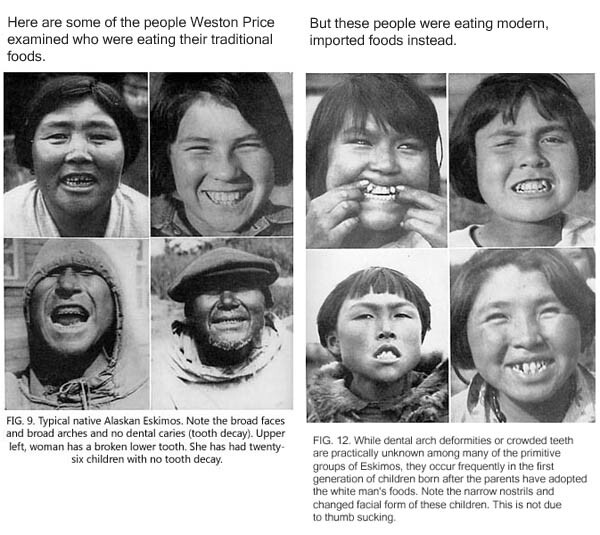 Wherever isolated people groups continued to eat their traditional diets, free from the modern foods we’re familiar with today, the people had uncrowded teeth that were almost entirely free of decay. These Eskimos ate a diet that consisted of salmon, seal and seal oil, fish eggs (fresh and dried), caribou, ground nuts, kelp, berries, organs of the large animals of the sea, including certain layers of the skin of one of the species of whale, which has been found to be very high in vitamin C.
Being a scientist, Price sent samples of the native foods back to his lab in America, where he analyzed them and learned that on average, the primitive diets contained at least 10 times more fat soluble activators than what is present in the average American diet. In other words, in just one day, the people Price studied got as much nutrition out of one meal as we get out of 10.The fat soluble activators are vitamins A, D, and K2, and according to Dr. Price are needed by our bodies in order to absorb the minerals in our diet. So much so that without these activators, our bodies are unable to use minerals that give us good sound bone structures and healthy, cavity-free teeth – even if minerals are plentiful in the diet. Both cod liver oil and deep yellow butter from grass-fed cows are rich in fat soluble activators. Once back in the states, Dr. Price used the combination of these two supplements as the keystone of his practice. 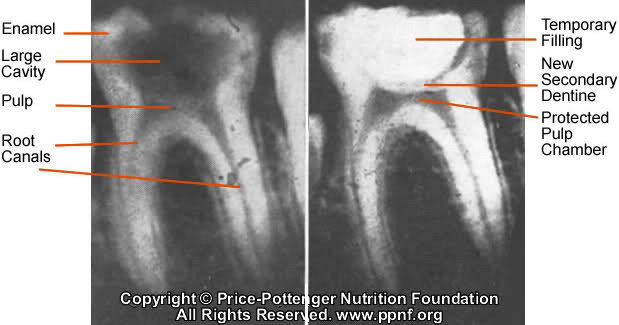 In another one of his efforts, Dr. Price initiated a lunch program for children who already had pretty bad tooth decay. And no wonder. These kids were eating highly sweetened coffee, pancakes made with white flour and covered with processed syrup, doughnuts, vegetable oils, and white bread. Dr. Price also gave each child half a teaspoon of cod liver oil and half a teaspoon of high vitamin butter oil along with their nutrient-dense lunch. Our family has been taking cod liver oil since 2002, when our fourth child was born. It’s a great feeling to actually have something I can do to help my children develop the same kind of robust health Dr. Price found in the traditional societies he visited. 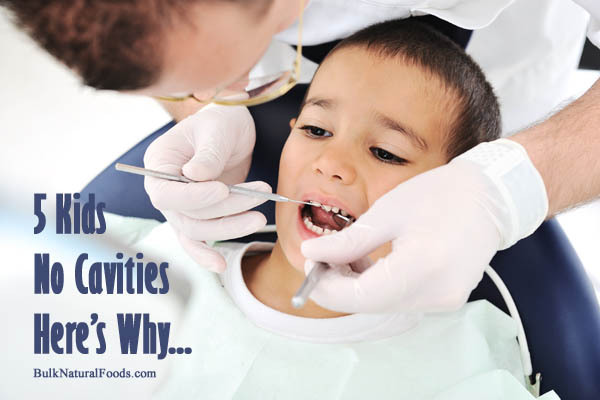 Our five kids are cavity-free, and the younger ones who had cod liver oil and butter oil as babies and throughout their growing-up years have naturally straight teeth too. I never would have thought it was possible because my teeth and my husband’s teeth were a crooked mess! Order here to have these supplements shipped to your door.